It’s a Monday afternoon, and Myles Kennedy is in a hotel room in San Francisco. Or, at least, he thinks he’s in San Francisco. “I don’t know where I am half the time,” he said with a laugh. And no wonder: Kennedy, a Spokane native, has been busy on tour opening for Aerosmith with Guns N’ Roses and Velvet Revolver guitarist Slash, and as soon as he has a break from that, he’ll be hitting the road again with his band Alter Bridge. He still lives in Spokane, but he’s rarely home these days, and he hasn’t played a major local show since Alter Bridge passed through here in 2010. In the last decade, Kennedy has become something of a local legend: He got his start as a guitar teacher and musician here (his earliest bands include Citizen Swing and the Mayfield Four), and he gained national prominence as the lead vocalist and guitarist for Alter Bridge, a hard rock quartet that formed following the breakup of late ’90s hit-makers Creed. “On that record, there were a lot of different singers that he brought on board to collaborate and write with him, everyone from Ozzy (Osbourne) to Fergie to Lemmy from Motörhead,” Kennedy said. “So when he called I was pretty shocked, to say the least, that he even thought of me. We hit it off … and ended up doing two songs together on that record, then we discussed the idea of touring. Kennedy’s is the only voice you’ll hear on the new Slash record, “World on Fire,” which will be released Sept. 15 and is co-credited to backing band the Conspirators. 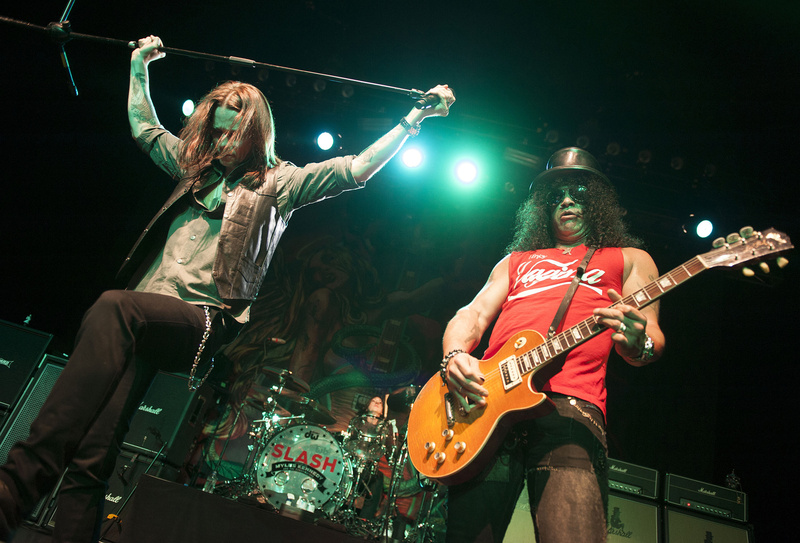 Kennedy describes his working relationship with Slash as a healthy and productive one. “Considering the amount of success that he’s had – he’s an icon – he doesn’t act like it, and that makes it really great from an artistic standpoint. … Slash will have a very clear idea musically of what he wants to do, so he’ll send me a riff or a chord progression. It’s kind of like this sonic canvas to paint over with my melodies and lyrics. And though his schedule isn’t going to slow down anytime soon, further keeping him away from home, Kennedy says he always looks forward to returning to Spokane (Alter Bridge is scheduled to play the Knitting Factory in October).